About twice a year, I have to get out. I have to physically remove myself from my surroundings, go some place new, have an experience, and do something. It's ingrained deep within my spirit, a rising temperature that reaches its pinnacle and forces me into unknown territory, adventure, and discomfort paired with wonder and awe. These adventures are often flavored with an amount of challenge, suffering, and joy. I've chosen the perfect line of work for this particular need, the university teaching position in Korea, where we are awarded with two long and generous vacations each year- one in summer and one in winter. In the past 5 years, I've always gotten out by literally getting out of Korea, going abroad, traveling, going to Georgia, San Francisco, southeast Asia, Mexico and central America, Japan, anywhere. As most expats in Korea will tell you, getting out is essential for mental and physical health. Korea is a lovely place, I assure you. But there is a sense that one needs renewal, that the batteries can only be charged once you've left the peninsula, surrounded on all sides by water but the one that is North Korea, and that sanity can only be maintained by these periodic sabbaticals far away from kimchi, far away from the dense population, far away from the balli balli (fast, fast) life, far away from bowing when I greet someone, far away from all the strangely endearing customs of life here that I have grown to love and at the same time need a break from. Now that I'm married to my amazing Korean wife, Jina, the frequency and duration of these various sabbaticals has had to be recalculated and renegotiated. She's a full time government employee at a national university here, and while its a secure job with relatively good hours and pay, the vacation time is extremely limited. In relation to my own vacation time, its barely a wink. I'd love nothing more than to wisk us both off on these saabaticals-- go to, say, Europe, or take her on a road trip in the States, or travel around Argentina; but alas, Jina is only given about ten working days off a year, and we have used those to visit my family in the States and take small vacations around here. So now I'm left with an internal dilemma- part of me still needs to get out. But another part of me, more importantly, wants to be near my wife, not too far away and definitely not for too long. Really, I have no business nor the desire to take off on a long journey just to straighten out my head while leaving behind my family. But there still is the problem- how do I get out? How do I maintain my sanity and recharge my batteries? This year I concocted a plan: I decided to get out by plunging even further into Korea. I know that sounds silly, but let me explain. I've been in Korea for six years, and I've done quite a bit of traveling here. But its always been on shorter trips, weekend excursions, going with friends, family, co-workers. I've always been more of an expat here, and not just a full-on tourist experiencing the country through pure traveler's eyes. So, with my newly hatched plan, the idea was to get away from home for a couple of weeks, be a true tourist in my adopted country, and to do it all on bicycle, the way God intended for us all to travel. Ever since I did a cycling trip in New Zealand in 2008, I've had the idea planted firmly in the deep recesses of my brain to buy a touring bicycle and make cycling a primary mode of travel. I've thought about doing it here, and now, being married, I figured that this would be the perfect trip to execute. I am getting out, but I'm not leaving Jina behind, not really-I'm still in the country, just out for a bit on my bicycle. 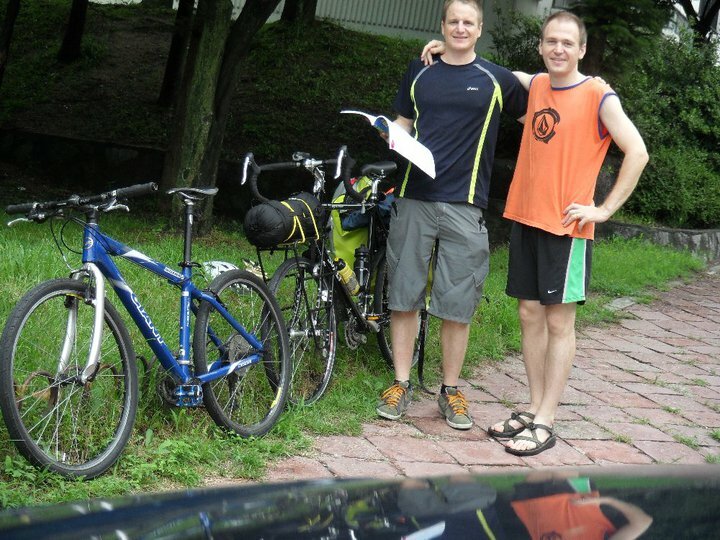 And, to make the distance and length shorter, we made a plan to meet on the two weekends that I would be cycling in spots that we've been wanting to go and that would make for good stops on my “Tour de Korea”. I bought a new touring bicycle, some panniers, and began mapping out my route. My good friend Gravy even signed on to go the first few days from Chuncheon out to Donghae, Korea's East Sea (By the way, you probably won't find East Sea on the map. Most world maps show the body of water as The Sea of Japan, and for many a reason I won't go into here, that just doesn't fly with the Koreans. Although in all fairness, the only country that it is east of is Korea, which makes East Sea also a bit ethnocentric of a name. Perhaps one day a more egalitarian title will arise, but I wouldn't hold my breath). I had to finish up some work I was doing, and the week finally arrived. On Tuesday, the day before we would leave, I went for a short run on the trail wearing the Vibram Five Finger shoes as part of my recent shift towards “barefoot” running, and a sharp pain shot through the top of my foot midway through the run. I tried to ignore it, but eventually had to stop and walk back home. Hours later I was limping, and by night time my foot was slightly swollen and I could barely put weight on it. Stress fracture. I'd been reading the warnings about being overzealous in the barefoot transition, but had continued to shun the shoes for all of my runs, including the long ones, apparently in love with the barefoot freedom and sensation. Now I was feeling the full measure of my heedless, headlong fall into barefoot running. Surprisingly, riding a bicycle did not hurt at all. In fact, riding a bicycle was preferable to walking. If I was being taught a lesson here, then, this lesson was lined with a generous helping of grace and mercy. I would be on a bicycle for the next two weeks, so the stress fracture would just be a minor detail, something to heal up while I was continuing training for the marathon on my bicycle. Although it would definitely prove to be a nuisance at times, the foot never bothered me while pedaling. And so we got to pedaling. I woke up on the big day with a sore foot, and had to limp up from our yeo (pronounced yo!, this is the floor pad that Koreans have been sleeping on for centuries. We've been sleeping on this all summer out in the living room because that is the most ventilated room). My foot was hurting worse than when I went to bed. Great... and on this auspicious note, I made a strong cup of coffee, stared at the piles of not yet packed cargo strewn about on the floor in our bedroom, maybe supposing that the caffeine that would soon enter my blood stream and my brain would endow me with the power to think the contents into the panniers. This didn't happen, so after a while I started packing them up, manually. We went to retrieve Gravy from the bus station, then dropped Jina off at work, got back home and were ready to go. 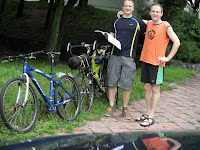 Once we got outside, I got the panniers on the bike, and all the other things: tent, sleeping pad, etc. bungeed onto the racks. I became painfully aware of having broken a cardinal rule pertinent to all varieties of self-propulsion: I overpacked. The bike looked as if it were pregnant, and when I tried to lift it I could barely, just barely, lift it off the ground. Meanwhile, Gravy was getting pumped, already having mounted his bike and riding around in circles. I limped around the bike, decided that four flights of steps was too much to limp up to get rid of items, and signaled to Gravy, whose eagerness was rising to a level of frenzy, that we were ready. So, we set off. Should've unpacked some stuff. What did I pack, exactly? I'll tell you if you promise not to laugh. I packed three novels, one Korean language textbook, two moleskine notebooks, and a bunch of pens. I wanted to get reading, studying, and writing done along the way. Hey! you never know when you may be confined to a coffee shop in the middle of a typhoon. I also packed a 200 page Korean road atlas that weighed at least two pounds. A camping stove, two fuel canisters, a tea kettle, a hand held coffee drip, a tent, sleeping bag, sleeping pad, two spare inner tubes, cleaning supplies, chain grease. As for clothes, I packed two pairs of cycling shorts, one pair of board shorts, one pair of gym shorts for sleeping, one pair of cotton shorts, five pairs of underwear and the same number of socks, three polysynthetic running shirts, one collared dinner shirt, and one cotton t-shirt. For food I brought one large package of beef jerky, a zip lock chock full of gorp, six granola bars, one package of Carr's Lemon Ginger cookies, and a container full of ground coffee. For my dob kit I stuffed it with deodorant, toothpaste and toothbrush, face cream with spf, Dr. Bronner's peppermint all-in-one freaky soap, and some sun cream. Basically I felt like my mother, who, like most mothers, is a notorious over-packer. She would usually take two suitcases to visit my relatives 3 hours away for the weekend. And yet, here I was. What can you do? Its hard for me to conceptualize what I will and ultimately won't need before a trip begins. The clarity comes only once we've departed, thus rendering the epiphany useless. Oddly, I had the JJ Cale song “Traveling Light” humming away in the back of my mind as we pulled off, perhaps a signal from deep down in my subconscious telling me to unload stuff. Not registering this as a signal, I just hummed along and got moving. The bicycle seemed to just shrug when I put the weight on it, and when I got to pedaling, the bike didn't seem to mind the weight at all. It moved steadily and smoothly, and I was confident that I had made a good, albeit expensive choice in bicycles.